"Juror" redirects here. For the 1996 film, see The Juror. A jury is a sworn body of people convened to render an impartial verdict (a finding of fact on a question) officially submitted to them by a court, or to set a penalty or judgment. Modern juries tend to be found in courts to ascertain the guilt, or lack thereof, in a crime. In Anglophone jurisdictions, the verdict may be guilty or not guilty (not proven; a verdict of acquittal, based on the state's failure to prove guilt rather than any proof of innocence, is also available in Scotland). The old institution of grand juries still exists in some places, particularly the United States, to investigate whether enough evidence of a crime exists to bring someone to trial. Prior to the Act, the main means of ensuring impartiality was by allowing legal challenges to the sheriff's choices. The new provisions did not specifically aim at establishing impartiality, but had the effect of reinforcing the authority of the jury by guaranteeing impartiality at the point of selection. Jurors are generally required to keep their deliberations in strict confidence during the trial and deliberations, and in some jurisdictions even after a verdict is rendered. In English law, the jury's deliberations must never be disclosed outside the jury, even years after the case; to repeat parts of the trial or verdict is considered to be contempt of court, a criminal offense. In the United States, confidentiality is usually only required until a verdict has been reached, and jurors have sometimes made remarks that called into question whether a verdict was properly reached. In Australia, academics are permitted to scrutinize the jury process only after obtaining a certificate or approval from the Attorney-General. In United States v. Moylan, 417 F.2d 1002 (4th. Cir. 1969), Fourth Circuit Court of Appeal unanimously ruled: "If the jury feels that the law under which the defendant is accused is unjust, or exigent circumstances justified the actions of the accused, or for any reason which appeals to their logic or passion, the jury has the right to acquit, and the courts must abide that decision." The Fully Informed Jury Association is a non-profit educational organization dedicated to informing jurors of their rights and seeking the passage of laws to require judges to inform jurors that they can and should judge the law. In Sparf v. United States, 156 U.S. 51 (1895), the Supreme Court, in a 5-4 decision, held that a trial judge has no responsibility to inform the jury of the right to nullify laws. The standard justification of jury equity is taken from the final few pages of Lord Devlin's book "Trial by Jury". Devlin explained jury equity through two now-famous metaphors: that the jury is "the lamp that shows that freedom lives" and that it is a "little parliament". The second metaphor emphasises that, just as members of parliament are generally dominated by government but can occasionally assert their independence, juries are usually dominated by judges but can, in extraordinary circumstances, throw off this control. Devlin thereby sought to emphasise that neither jury equity nor judicial control are set in stone. Twelve jurors decide by a qualified majority of two-thirds whether the defendant is guilty or not. A tied vote results in 'not guilty'; a '7 guilty - 5 not guilty' vote is transferred to the 3 professional judges who can, by unanimity, reverse the majority to 'not guilty'. The sentence is delivered by a majority of the 12 jurors and the 3 professional judges. As a result of the Taxquet ruling the juries give nowadays the most important motives that lead them to their verdict. The procedural codification has been altered to meet the demands formulated by the European Court of Human Rights. The Canadian Charter of Rights and Freedoms guarantees that anyone tried for an offence that has a maximum sentence of five or more years has the right to be tried by a jury (except for an offence under military law). Article 86 of the Hong Kong Basic Law assures the practice of jury trials. Criminal cases in the High Court and some civil cases are tried by jury in Hong Kong. There is no jury in the District Court. In addition, from time to time, the Coroner's Court may summon a jury to decide the cause of death in an inquest. Criminal cases are normally tried by a 7-person jury and sometimes, at the discretion of the court, a 9-person jury. Nevertheless, the Jury Ordinance requires that a jury in any proceedings should be composed of at least 5 jurors. Juries were formerly used in India up until the famous KM Nanavati v State of Maharashtra (1959), which led to the abolition of jury trials. In the former scenario, Nanavati would be charged under the Indian penal code 302, for culpable homicide, with a maximum punishment of 10 years. In the latter, he would be charged with murder, with the sentence being death or life imprisonment. Nanavati pleaded not guilty. His defence team argued it was a case of culpable homicide not amounting to murder, while the prosecution argued it was premeditated murder. The jury in the Greater Bombay sessions court pronounced Nanavati not guilty under 302  with an 8–1 verdict. The sessions judge considered the acquittal as perverse and referred the case to the high court. The prosecution argued that the jury had been misled by the presiding judge on four crucial points. One, the onus of proving that it was an accident and not premeditated murder was on Nanavati. Two, was Sylvia's confession of the grave provocation for Nanavati, or any specific incident in Ahuja's bedroom or both. Three, the judge wrongly told the jury that the provocation can also come from a third person. And four, the jury was not instructed that Nanavati's defence had to be proved, to the extent that there is no reasonable doubt in the mind of a reasonable person. The court accepted the arguments, dismissed the jury's verdict and the case was freshly heard in the high court. Since the jury was alleged to have been influenced by media and public support for Nanavati, the Indian government abolished jury trials after the case even though no comparative study was done on media influence on judges and on Jury. Nanavati was finally pardoned by Vijayalakshmi Pandit, newly appointed Governor of Bombay and sister of Prime Minister Jawaharlal Nehru. Nanavati was said to be very close to Nehru. The law of the Republic of Ireland is historically based on English common law and had a similar jury system. Article 38 of the 1937 Constitution of Ireland mandates trial by jury for criminal offences, with exceptions for minor offences, military tribunals, and where "the ordinary courts are inadequate to secure the effective administration of justice, and the preservation of public peace and order". DPP v McNally sets out that a jury has the right to reach a not guilty verdict even in direct contradiction of the evidence. Juries are used in trials for all trials involving Category 4 offences such as treason, murder and manslaughter, although in exceptional circumstances a judge-alone trial may be ordered. At the option of the defendant, juries may be used in trials involving Category 3 offences, that is offences where the maximum penalty available is two years imprisonment or greater. In civil cases juries are usually only used in cases of defamation. Juries must initially try to reach a unanimous verdict, but if one cannot be reached in a reasonable timeframe, the judge may accept a majority verdict of all-but-one (i.e. 11–1 or 10–1) in criminal cases and three-quarters (i.e. 9–3 or 9–2) in civil cases. Jury trials have been very slowly introduced in Spain and have often produced less than desirable results. One of the first cases was that of Mikel Otegi who was tried in 1997 for the murder of two police officers. After a confused trial, five jury members of a total of nine voted to acquit and the judge ordered the accused set free. This verdict shocked the nation. Another alleged miscarriage of justice by jury trial was the Wanninkhof murder case. Jurors, like most individuals, are not free from holding social and cognitive biases. Oftentimes people negatively judge individuals who do not adhere to established social norms (e.g., individuals who dress "freakishly") or do not meet societal standards of success. Although these biases tend to influence jurors’ individual decisions during a trial, while working as part of a group (i.e., jury), these biases are typically controlled. Groups tend to exert buffering effects that allow jurors to disregard their initial personal biases when forming a credible group decision. ↑ "CURRENT GRAND JURY REPORTS - Miami Dade Office of the State Attorney". Miamisao.com. Retrieved 2014-01-05. ↑ Daniel Klerman, "Was the Jury Every Self-Informing" Southern California Law Review 77: (2003), 123. ↑ "The Islamic Origins of the Common Law - John A. Makdisi". Scribd.com. Retrieved 2014-01-05. ↑ Oxford History of England, 2nd ed 1955, vol III Domesday Book to Magna Carta, A l Poole, pp.397–398. ↑ Garnish, Lis (1995). "Wantage Church History" (PDF). Local History Series. Vale and Downland Museum. Retrieved 2009-09-24. ↑ See, for example, discussions of the Brunner theory of testimonial, rather than judicial participation as jury origin, explored in MacNair, Vicinage and the Antecedents of the Jury - I. Theories, in Law and History Review, Vol. 17 No 3, 1999, pp. 6–18. ↑ Carey, Christopher. "Legal Space in Classical Athens." Greece & Rome 41(2): October 1994, pp. 172–186. ↑ Holdsworth, William Searle (1922). A History of English Law. 1 (3 ed.). Little, Brown. pp. 268–269. OCLC 48555551. ↑ Sanders, Joseph (16 January 2008). "A Norms Approach to Jury "Nullification:" Interests, Values, and Scripts". Law & Policy. Law & Policy. 30 (1): 12–45. doi:10.1111/j.1467-9930.2008.00268.x. ↑ See, e.g., Federal Rule of Civil Procedure 52 (2011); Colorado Rule of Civil Procedure 52 (2011). ↑ jury nullification definition - Dictionary - MSN Encarta. Archived from the original on 2009-10-31. ↑ Luckhurst, Tim (March 20, 2005). "The case for keeping 'not proven' verdict". The Sunday Times, TimesOnline. Retrieved 2009-09-24. ↑ Broadbridge, Sally (15 May 2009). "The "not proven" verdict in Scotland" (PDF). Standard Note SN/HA/2710. U.K. Parliament, House of Commons, Home Affairs Section. Retrieved 2009-09-24. ↑ Criminal Code, RSC 1985 c C-46, s 785, "summary conviction court"
↑ Criminal Code, RSC 1985, c C-46, ss 471-473. ↑ Criminal Code, RSC 1985, c C-46, s 631(2.1). ↑ Criminal Code, RSC 1985, c c-46, s 644. ↑ Lloyd-Bostock S, Thomas C. (1999). DECLINE OF THE "LITTLE PARLIAMENT": JURIES AND JURY REFORM IN ENGLAND AND WALES.Law and Contemporary Problems. ↑ "First trial without jury approved". BBC News. 18 June 2009. ↑ Glendon MA, Carozza PG, Picker CB. (2008) Comparative Legal Traditions, p. 251. Thomson-West. ↑ Casper, Gerhard; Zeisel, Hans (January 1972). "Lay Judges in the German Criminal Courts". Journal of Legal Studies. 1 (1): 135–191 . doi:10.1086/467481. JSTOR 724014. ↑ "Love/Death and Scandal in Bombay". 2016-08-12. Retrieved 2016-08-18. ↑ "Reality of Nanavati case and why Jury was abolished". www.facebook.com. Retrieved 2016-08-18. ↑ "Before You Watch Akshay Kumar's Rustom, Here's Everything You Need To Know About The Real Case". Retrieved 2016-08-18. ↑ "288. Some Facts about K.M.Nanavati case of 1959 and Jury system". www.facebook.com. Retrieved 2016-08-18. ↑ "CONSTITUTION OF IRELAND: TRIAL OF OFFENCES". Irish Statute Book. August 2012. Retrieved 1 November 2013. 1 2 3 "Jury service". Citizens Information Board. 2 October 2012. Retrieved 1 November 2013. ↑ "Juries Act, 1976". Irish Statute Book. Retrieved 1 November 2013. ↑ "Civil Law (Miscellaneous Provisions) Act 2008; PART 6: Juries". Irish Statute Book. Retrieved 1 November 2013. ↑ "Courts Service to notify gardaí of jury non-reporting". Irish Legal News. 16 February 2016. Retrieved 17 February 2016. ↑ "Criminal trials". Citizens Information Bureau. 29 August 2012. Retrieved 1 November 2013. ↑ "Special Criminal Court". Citizens Information Board. 6 August 2009. Retrieved 1 November 2013. 1 2 3 4 "Role of the jury". Citizens Information Board. 5 September 2012. Retrieved 1 November 2013. ↑ "Inquests". Citizens Information Bureau. 9 September 2010. Retrieved 1 November 2013. ↑ "Consultation Paper on Jury Service". Irish Law Reform Commission. 29 March 2010. Retrieved 1 November 2013. ↑ "JURY SERVICE" (PDF) (107-2013). Law Reform Commission. April 2013. ISSN 1393-3132. 1 2 "Courts and Civil Law (Miscellaneous Provisions) Act 2013, Section 23". Irish Statute Book. 24 July 2013. Retrieved 1 November 2013. 1 2 McDonald, Dearbhail (1 November 2013). "Anglo criminal trial: Larger 15 strong jury panel appointed". Irish Independent. Retrieved 1 November 2013. ↑ "NZ's first majority guilty verdict". Stuff. Retrieved 2009-06-03. ↑ "Lov om rettergangsmåten i straffesaker (Straffeprosessloven)". Lovdata. Retrieved 2008-08-22. ↑ "Why Was I Picked For Jury Service?". Courtroom Advice. Retrieved 2010-09-21. ↑ Archived December 22, 2011, at the Wayback Machine. ↑ "The advantages and disadvantages of lay judges from a Swedish perspective". Cairn.info. Retrieved 2014-01-05. ↑ King NJ (1999). "The American Criminal Jury". Law and Contemporary Problems. 62 (2): 41–67. doi:10.2307/1192252. JSTOR 1192252. Retrieved 2009-06-04. 1 2 3 4 5 6 Landsman S. (1999). "The Civil Jury in America". Law and Contemporary Problems. 62 (2): 285–304. doi:10.2307/1192260. JSTOR 1192260. Retrieved 2009-06-04. ↑ Amar, A.R. (1998). The Bill of Rights. New Haven, CT: Yale University. pp. 81–118. ↑ "Plea Bargains and the Role of Judges". 2008 National Convention Breakout Session. The American Constitution Society for Law and Policy (ACS). Retrieved 2009-09-24. ↑ This power is often used in drug cases "to impose an enhanced sentence ... based on the sentencing judge's determination of a fact that was not found by the jury or admitted by the defendant". 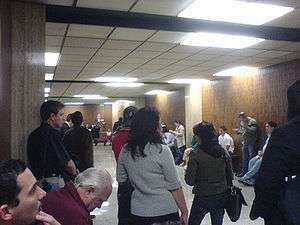 In April 2008, the U.S. District Court, in a 236 page opinion to address this ruled that juries should be told before they deliberate if a defendant is facing a mandatory minimum sentence and also called it "inappropriate" to ignore the juries power to refuse to convict (jury nullification). ↑ Archived April 27, 2012, at the Wayback Machine. ↑ "Human Genome Project Information Site Has Been Updated". Ornl.gov. 2013-07-23. Retrieved 2014-01-05. 1 2 Kalven, H. & Zeisel, H. (1966). The American Jury. Boston: Little, Brown. ↑ Wrightsman, L., Nietzel, M. T., & Fortune, W. H. (1998). Psychology and the legal system (4th edition). Monterey, California: Brooks/Cole. ↑ Kerr, N. L., & Huang, J. Y. (1986). How much difference does one juror make in jury deliberation. Personality and Social Psychology Bulletin, 12, 325-343.